One of the challenges of cross-string ornaments is getting them quick enough. While cadential and longer trills start a bit slower, mid-phrase trills and mordents must be quick. From a technical standpoint, that means the ornament has to feel like one, quick motion. Not like a bunch of individual fingers. This post explains how to work those trills up. I’m going to take you through practicing an a i m p trill. What you need to do is practice fast to perform fast. You can play fast, but you might not be able to do it for long periods. What to do? Start small. Like a scale, cross-string trills can be practiced in small bursts. Since most of our trills require only a few alternations, we have to start smaller. Try just doing the first few notes of the trill as quickly as possible. Do this with open strings. After it feels like playing those two notes quickly is effortless, add in planting of the next finger. Then play m, creating a burst of three notes. Add another plant with the last finger, p.
Finally, add p at the end, creating a four-note burst. You might have to repeat this process for several consecutive days before it feels like the trill is one motion. After the trill is up to speed, and you don’t feel any additional benefits from practicing the above, it’s time to use some other practice methods. There’s a couple different ways you can practice this. You could use Slow Fast Alternation to practice the trill. You can also start with different finger pairs or start with different fingers. 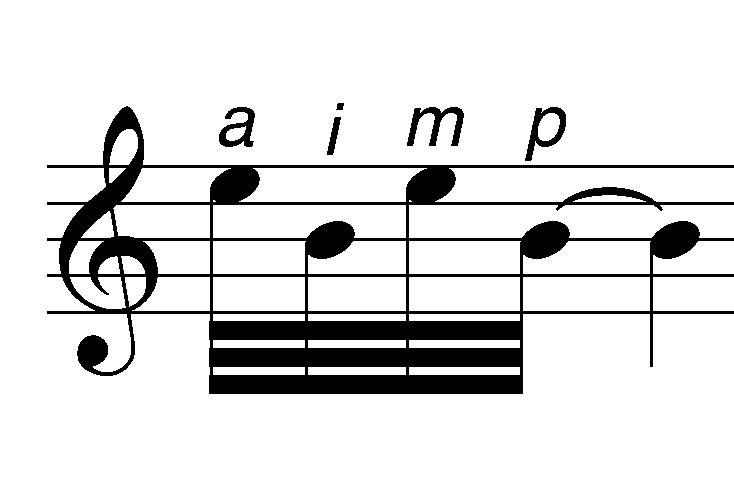 a i m p is a typical, baroque trill that begins with upper auxiliary, but you could also practice classical style trills that begin with the main note. Or start with different fingers for the typical two alternations. You can also add more alternations to the trill. To do this I’d suggest using the method above: add a plant, then add the finger actually playing. Build up the trill to a greater length rather than trying to just do it.